Shows Improvement in Joint Comfort within 7 Days! Joints are the place where bones, connective tissue and cartilage all come together to promote movement. Cartilage is the connective tissue that helps form important structural components in joints. Glucosamine helps to support both cartilage and joint health by providing the building blocks for cartilage formation, which in turn works to help maintain the structural integrity of joints. In addition, Glucosamine acts as a lubricant, which helps to ease occasional joint stress and stiffness due to physical activity. You can use Flex-a-min Double Strength for your joints daily to support mobility, flexibility and range of motion all day long! 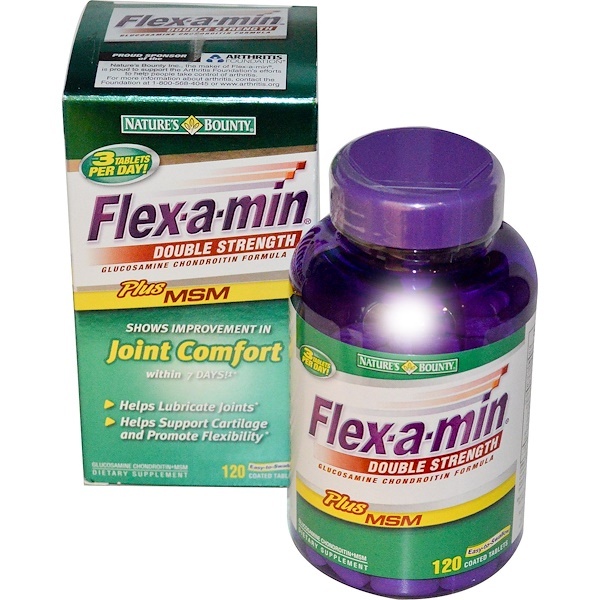 Flex-a-min Double Strength contains joint factors to help lubricate, cushion and revitalize your joints. 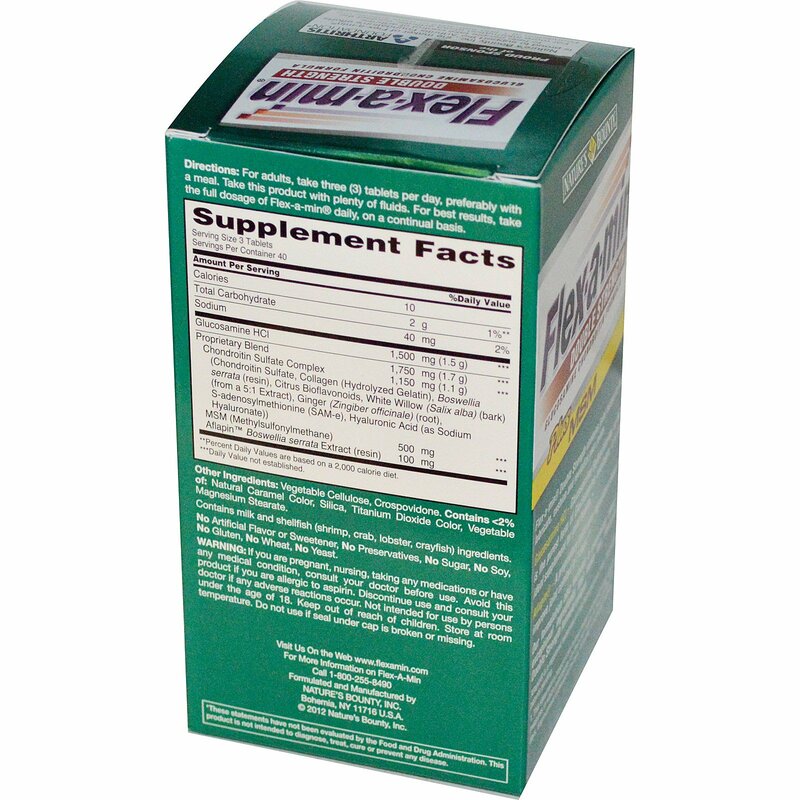 Glucosamine HCl – Glucosamine Hydrochloride, or HCl, is the purest form of Glucosamine available. It is the ideal supplement for joint health. Our formulation also includes a proprietary blend of exceptional ingredients that makes this Flex-a-min Double Strength formula unique. ¹This statement is based on two human studies of Aflapin using subjective measures in which participants rate their joint health. In these studies, after 7 days, improvement continued to be seen, including in biomarker analysis. For adults, take three (3) tablets per day, preferably with meals. Take this product with plenty of fluids. For best results, take the full dosage of Flex-a-min daily, on a continual basis. Vegetable cellulose, crospovidone. Contains <2% of: Natural caramel color, silica, titanium dioxide color, vegetable magnesium stearate. Contains milk and shellfish (shrimp, crab, lobster, crayfish) ingredients. No artificial flavor or sweetener, no preservatives, no sugar, no soy, no gluten, no wheat, no yeast. If you are pregnant, nursing or taking any medications or have any medical condition, consult your doctor before use. Avoid this product if you are allergic to aspirin. Discontinue use and consult your doctor if any adverse reactions occur. Not intended for use by persons under the age of 18. Keep out of reach of children. Store at room temperature. Do not use if seal under cap is broken or missing.